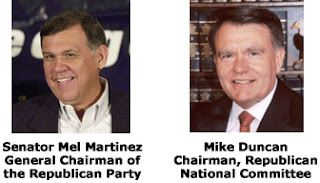 Last Friday, the Republican National Committee elected Sen. Mel Martinez as General Chairman of the Republican Party and Mike Duncan as Chairman of the Republican National Committee. In a joint statement, they identified that to regain the majority and retain the White House, we cannot just show that we want it more. 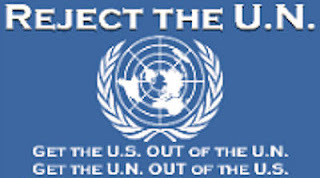 We need to prove to the American people that we deserve it more. We need to be proud of our principles, confident that our ideas are best for the nation. We can't afford to wait another day. We must return to our roots as the party of freedom and reform, of lower taxes, limited government, individual responsibility, freedom here and abroad, and the power of faith. They are seeking your ideas on how we can make our Party stronger, now and in 2008 at http://www.GOP.com/YourIdeas .